Though unrelated to the referendum, a report published a few weeks before the vote, studying excess mortality in Glasgow and Scotland, provides arguably the most detailed evidence on the impact of political decisions on health in a city and country. Again, inequalities and poverty provide a thread throughout the report. Major EU investment into deprived areas across the UK is now at threat, raising the spectre of further hardship and inequalities. Source: History, politics and vulnerability: explaining excess mortality (GCPH 2016) (click image to see full document). In the aftermath of the referendum we appear to live in fractured times, with systems and structures developed over decades to protect and promote freedom, equality and human rights at threat. Racist threats and attacks have increased. Relations between politicians, columnists and members of the general public on mainland Europe and the UK have soured. Stress levels at a period of such uncertainty are likely to increase and impact on mental health and wellbeing. It is ironic therefore that this feared fragmentation at a supranational level, and the narrowing of outlook and prospects at a national level, comes at a time when technology brings us ever closer together, through social media, teleconferencing and the cogs of the world wide web. The Public Health Hour webinar series was born out of a desire to improve communication and connections across a wide community interested in Public Health, including social determinants of health, reducing inequalities, community development and beyond. 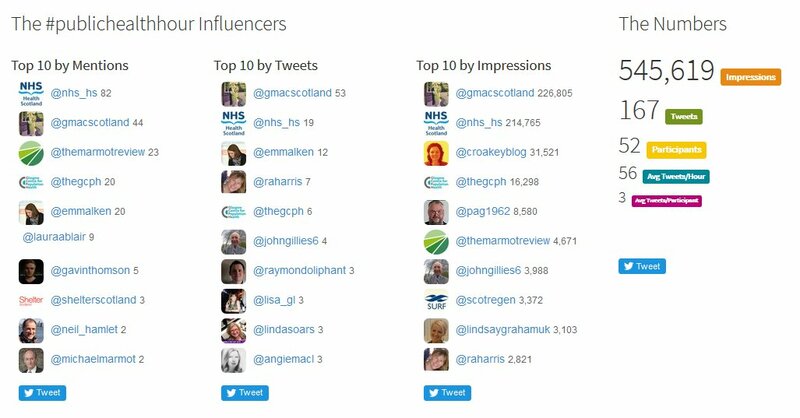 Though initiated in Scotland (using #ScotPublicHealth hashtag) we have developed links across the world (as illustrated in activity on Twitter for example), and we continue to work to break down barriers between organisations and countries (though time zones do get in the way). The fourth Public Health Hour (1 June 2016) looked at health inequalities, and inequalities more generally, with expert input from Dr Andrew Fraser, Director of Public Health Science, Health Scotland and Dr Angela Donkin, Associate Director, Institute of Health Equity, University College London. As with all our Public Health Hours we also looked at the role of social media in disseminating, learning and networking around the topic, drawing on the expertise of Laura Blair, Senior Communications and Engagement Officer at NHS Health Scotland. The full presentations from the Public Health Hour are available by clicking on the links in the paragraph above. We talked about definitions, epidemiology and actions to reduce inequalities. Some of the starkest examples of inequalities come from life expectancy statistics. We can see differences over time (eg Scotland’s declining rank in global comparisons) and between areas and populations (eg differences between areas across the UK). The differences are even more apparent looking at healthy life expectancy. Looking at individual conditions (eg mental health), differences in life expectancy are even apparent in Scandinavian countries. Inequality is a challenge across the world. Source: Dr Gerry McCartney. What would be sufficient to reduce health inequalities in Scotland? NHS Health Scotland (2012) (click image to see full document). While differences in life expectancy are stark and easy to measure, there are also important differences in other outcomes including wellbeing and life satisfaction. The social determinants of health – for example income, housing, green space – each have an impact on physical and mental health, and all show inequalities across society. Source: UCL Institute of Health Equity (click image to see full document). Some groups are particularly vulnerable. The global financial crisis of 2008 had a disproportionate impact on young people (eg a large rise in young people not in employment, education or training). Even relatively short periods of hardship can worsen outcomes throughout life. Individual health behaviours (eg drinking, smoking, inactivity) play a surprisingly small part in health inequalities. Upstream causes (global forces, political priorities, societal values, power, income and wealth) are much more important causes of inequalities, impacting on environment, communities and individuals, and therefore health inequalities. Our most vulnerable populations are the most likely to experience health inequalities, and they are also the last to experience the benefits of progress in Public Health, including advances over the past 150 years in sanitation, communicable disease, coronary heart disease, smoking and alcohol consumption. Source: Health Inequalities Policy Reviewfor the Scottish Ministerial Task Force on Health Inequalities. NHS Health Scotland (2013) (click image to see full document). Unsurprisingly, therefore, interventions with greatest impact in improving health and reducing health inequalities are not focused on health services, but relate to income (eg a boost to Job Seekers Allowance and a living wage). The politics of austerity practised in many countries around the world, and the declining prospects during periods of political upheaval, represent major threats to both health and health inequalities. A theme that emerged from both presentations during the #PublicHealthHour was the need to make a financial case for reducing inequalities, both in Westminster and Scottish Parliament. We know that inequalities are bad for individuals but also society as a whole, well beyond the negative effects on health, but we need to present our knowledge in ways that reach and persuade politicians and the public, powerfully and persistently. Source: Informing investment to reduce health inequalities (III) in Scotland:a commentary. ScotPHO (2014) (click image to see full document). The #PublicHealthHour series provides an opportunity to share ideas and learn from each other around social media and other engagement tools. For this session we were lucky to have Laura Blair providing her experience running the social media operation at NHS Health Scotland (11,500 followers on Twitter, 1% engagement rate). We heard about use of different platforms (Facebook, Twitter, Instagram and YouTube), each with a different target audience and purpose. Social media promotes our work in tackling #healthinequalities, positions our organisation and protects our brand. Laura Blair, NHS Health Scotland. Images, videos and weblinks all increase the impact of a tweet or post on other social media platforms. We are learning important skills in communication through these #PublicHealthHour sessions, hearing consistent messages, tweeting more effectively as a result. Laura also told us about Canva as a tool for producing infographics (https://www.canva.com/). Examples of infographics from other contributors to the session are collected in the Storify summary. Image produced by NHS Health Scotland using Canva (click image to see full document). This was a rapid and well received overview of inequalities and health, from national experts. We covered a wide range of materials, with good levels of interaction, reaching a substantial audience through the webinar (live and recorded) and on social media. In the month since the session the world has changed, particularly for people living in the UK and rest of the EU. While the lasting impact of these changes is not yet known, we can be clear that inequalities will remain a topic central to public health for decades to come. There has been a lot of debate and commentary since the referendum on the economy, inequality, poverty, health and the health service. It is worth reflecting on a BMJ editorial published online a fortnight after the referendum result, written by Danny Dorling, Halford Mackinder professor of geography. He notes the negative impact of austerity on wellbeing and mortality and the positive impact of immigration into the UK. His conclusions could not be more pertinent to this discussion, encapsulating the impact of politics, fiscal measures and the broader determinants of health on health inequalities. Prof Dorling’s starting point is the increase in deaths and fall in wellbeing measures observed at a national level. The UK has benefited greatly from the immigration of healthier than average young adults, educated at someone else’s expense; many of them work in our health, educational, social, and care services. Their arrival reduced heath inequalities and improved our overall health. The underlying reason for worsening health and declining living standards was not immigration but ever growing economic inequality and the public spending cuts that accompanied austerity. Almost all other European countries tax more effectively, spend more on health, and do not tolerate our degree of economic inequality. To distract us from these national failings, we have been encouraged to blame immigration and the EU. That lie will now be exposed. Prof Danny Dorling. All that remains for me to say is thank you very much to Andrew, Angela and Laura for their contributions, and participants for joining in to make this such a successful session. Join us for the next #PublicHealthHour session on 7 September, 12.30. Please share widely. Dr Cath Calderwood, Scotland’s Chief Medical Officer, will be talking about Realistic Medicine. We had 34 participants on the webinar, and more contributing via Twitter (52 participants, 167 tweets, over 500,000 “impressions”). Participants joined us from the NHS, academia, local authorities and voluntary sector. While those joining were mainly from Scotland there was Twitter activity from across the world, albeit just from English speaking countries. Over 80 people registered for the event (using EventBrite), but presumably other commitments (or perhaps technological issues) meant that they could not join on the day. Nonetheless, the ticketing and administration provided through EventBrite proved much more efficient than previous sessions. Feedback from the session was positive, both in the chat box and via tweet (see appendix and Storify summary). We used Webex for the webinar, hosted for NHS Lothian by PGi. We negotiated some tweaks to the set up: switching off the audible joining/ leaving tone, activating recording (available here), and matching caller to computer login. This negotiation meant that the session ran smoothly and speakers were not interrupted as people joined and left the call. We enabled interaction in the chatbox and also in annotating the slides at the beginning, collecting information about location and organisation. Note that this information was not stored on the Webex session so I lost that information. Next time I’ll take a screen grab during the session. I summarised tweets from contributors using Storify. We used Slido to field questions before the session. This allows participants to raise questions and vote on other users’ questions. This is easy to use but requires promotion. We will use this for the next session too. We tracked Twitter activity using FollowTheHashTag and Symplur websites. These have different functionality. We used the free versions of each.